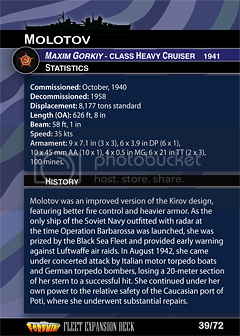 Kirov reprint, but with two different SAs that will be useful in a number of different settings. The Soviets do not have many choices, so any new reprint actually helps. 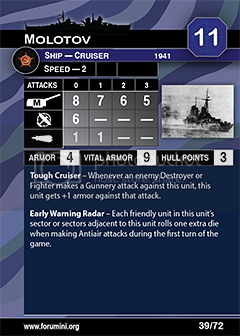 Tough cruiser is always solid when it appears, and painful to play a swarm against. Early Warning Radar will be interesting to see in play as well. Expect a lot of use out of this unit among the Soviets, but the SAs definitely seem more in line with making the Soviets both playable and power-gamish. Overall grade: B.